Coming to Wisconsin? Dog the Bounty Hunter? As you are aware late night backroom deals are alive and well in the Wisconsin State Capitol. With the state budget now on its way to the Assembly and Senate for approval, it is safe to say that at least Dog the Bounty Hunter will be celebrating this recent development, while the middle class and the economy will continue to suffer. While you were sleeping last night, the Republican controlled Joint Finance Committee approved extreme motions, one of which included permitting a private bail bond system to be implemented in Milwaukee and four other counties. Commercial bail bonds have been banned in Wisconsin since 1979 and faced near universal opposition from judges, lawyers and law enforcement. This opposition continues today on the basis that bail bonds are ineffective and a threat to public safety. Please help us fight against this measure with your contribution of $100, $50, $25 or $10. Republicans should not be allowed to let special interests trump the safety of Wisconsin’s citizens. You can help us stop these radical attacks on Wisconsin’s middle class by contributing $100, $50, $25 or $10. Your contribution will help ensure that we have the resources to stand up to Republicans. Is the Dairy State Ready for Tax Reform? This week Senator Kathleen Vinehout writes about Rep. Kooyenga’s proposed tax reform plan. Kathleen appreciates that he wants to have a conversation about tax reform, but she does not support his proposal. She offers to work with him on a bi-partisan proposal that is modeled after what experts tell us: Taxes should be low, broad-based, and transparent. Tax policy should not favor one type of business over another. 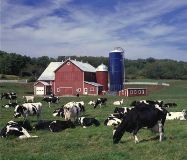 MADISON - Get rid of tax credits for dairy farmers? No tax breaks for meat or food processing plants? Get rid of credits for ethanol? Cut beginning farmer credits? You’ve got to give Representative Dale Kooyenga credit. The Brookfield Republican isn’t afraid to take on the dairy state’s sacred cows. Just as the state’s budget writing committee is wrapping up their work and Legislative leaders are about to broker a deal on public education and health, Rep. Kooyenga announces a proposal to rewrite the income tax code. He seems to start with agriculture in mind. I bet there aren’t many cows in Brookfield. Last summer, Representative Kooyenga and I served on a committee studying changes to the state’s income tax code. So it didn’t surprise me to see he was working on income tax reform. But his timing in unveiling the proposal and what seem to be big changes for farmers and ag-related businesses almost ensure its demise. That’s too bad because Wisconsin’s complex tax system needs reform. The complexity is the product of tax loopholes, not tax rates. The State Legislature rarely meets a tax credit it doesn’t like. The result is a cumbersome tax code that hasn’t been seriously evaluated since 1999 and then the Legislature ended work without repealing a single tax credit. There are 73 possible state adjustments after you file your federal taxes and there are dozens of credits to modify those adjustments. In the 2013 Department of Revenue report, I counted 37 credits that totaled $1.5 billion in lost revenue. My friends at the Revenue Department will remind me that the credits interact with each other and can’t always be added together: more complexity. Messing around with state income tax is frightening for anyone who runs an operation dependent on the state. That’s because so much of what the state buys is paid for by income taxes. State income tax makes up over half of the general fund – the source of state money for health, education, local government, corrections and universities. Wisconsin is more dependent on income taxes than all but 11 other states. While I commend the Brookfield Republican for getting this conversation started, I don’t agree with details of his proposal. For example, the proposed lowering of tax rates for high income earners - over $300,000. I don’t support his plan to allow millionaires to offset high off-farm earnings with (part-time?) farm losses. Currently no farm loss is allowed if it exceeds $600,000. The plan favors the wealthy and doesn’t include serious reform of property tax – the part of our tax system most out of line with the national average. Start-up companies are most burdened by property tax which impacts job creation. In the interest of advancing reform, I’d offer to be a bipartisan partner in the discussion. First, let’s agree on a few ground rules. The goal of tax reform must be revenue neutral – meaning when all the tax breaks and loopholes are ended, every dime must go to lowering rates – but not one penny below the total dollars saved by tax changes. I know Republicans who are too tempted to lower rates more than what we can afford. And some Democrats are very tempted to plow savings into new spending. Second, reform must be bipartisan, regardless of the party in power. Why? Because in this hyper-negative political environment, no rookie in a swing district is going to be comfortable voting to end a tax break to (name your favorite good cause) unless they know the party against them also voted to end the same break. Third, all taxes should be on the table. Property taxes can be regressive. Sales tax is almost always regressive. An income tax change on one group should be considered in the context of all other taxes that groups pays. Finally, no tax break is sacred. All should be regularly evaluated even if they are not eliminated. We badly need a process to evaluate what we get for our investment. The experts agree. Taxes should be low, broad-based, and transparent. Tax policy should not favor one type of business over another. But getting there is not for the faint-hearted. And timid does not describe my friend Dale. So, while you’re at it, Dale, maybe get rid of the Lambeau Field tax check-off? Senator Kathleen Vinehout writes about the need for DNR staff to inspect the growing number of frac sand mine operations. The number of sand mine operations has grown significantly since the summer of 2012 and staff is needed at DNR to monitor them. The Joint Finance committee voted down a motion to fund the needed 10 positions. Ms. King’s appeal was reported in an article written by Kate Prengaman of the Wisconsin Center for Investigative Journalism who closely follows the growing sand mine industry. “Nearly a fifth of Wisconsin’s 70 active frac sand mines and processing plants were cited for environmental violations last year,” wrote Prengaman. She quoted Air Management Specialist Marty Sellers who said he sent letters of noncompliance to “80 to 90 percent” of the sites he visited. The DNR’s limited resources means some frac sand mines are not inspected or only inspected when citizens complained about the mine. To address the staff shortage, the state budget includes two positions as dedicated sand mine monitors. However, additional positions were recently considered by the Legislature’s Joint Finance Committee. Monitors are needed to oversee air quality during mine construction and operation. New inspectors would monitor compliance with storm water rules, high capacity wells, wetlands and endangered resources. Inspectors review permits, blasting and fugitive dust control plans, discuss best management practices with the operator, inspect equipment and review company operation reports. The Joint Finance Committee was informed about the sand mine industry through a paper written by the nonpartisan Legislative Fiscal Bureau (LFB) which provided detailed information on the industry that has exploded in western Wisconsin. The LFB paper noted last summer the DNR reviewed staffing needs for permitting, compliance and monitoring of frac sand operations. At that time, the Department estimated 10.2 full-time positions were needed to oversee the 54 known sites. The fast growing industry now needs two to three times more inspectors. Joint Finance Committee member Senator Jennifer Shilling offered an amendment to fund at least those 10 positions. Still, the majority of Finance Committee members voted down Shilling’s amendment. Adequately funding sand mine monitors is important for neighbors, local government and the mine owners and workers. I receive many calls of neighbors concerned about mine operation. Local government officials are stretched thin and are often unable to monitor the mines. Most counties have few staff dedicated to the inspection of mines. Workers need necessary health and safety protections. Owners that do follow the rules are at a competitive disadvantage with those who do not. Citizens are rightly concerned when the state relies on them to monitor mine safety. It was from citizens that I learned of one of the most serious violations. 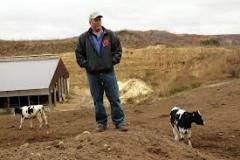 Last year Preferred Sands’ mine in Trempealeau County had a mudslide that affected a neighboring property. The WI Center for Investigative Journalism reported this mine also had “multiple violations of its air quality permit”. The violations are now being considered by the Department of Justice. Trempealeau County is the epicenter of sand mining. With 28 mines there is no higher concentration in the state. Recently, citizens delivered to Trempealeau County Board Supervisors petitions with 821 signatures in favor of a year-long sand mine moratorium. Petitioners were upset when supervisors ignored the stack of signatures and instead failed to pass the moratorium on new county mines. Citizens should not be charged with the monitoring of mines in their neighborhoods. If Wisconsin allows sand mining, Wisconsin must invest in staff to monitor compliance with the law. Not all 170 mines and processing plants are up and running. But it is reasonable to expect they will be by June of 2015, the end of the upcoming state budget. The Legislature should act to phase-in the funding for all 32 needed positions before the final passage of the two-year state budget. State Land for Sale in No Bid Contracts? MADISON - “I strongly supported the bipartisan Wisconsin Stewardship Fund,” a self-described Republican man from Eau Claire wrote to me. The letter came the week the state budget writing committee took up the Knowles-Nelson Stewardship Fund. Named for Wisconsin conservation minded Republican Governor Warren Knowles and Democratic Governor Gaylord Nelson the bipartisan program usually gathers broad support. Created in 1989, the Stewardship Program provides money for purchase of lands for recreation and preservation. According to the state’s Blue Book, over the two decades of its existence, the program spent over $500 million to acquire over 500,000 acres. State officials often work with land conservation groups who acquire the land with grants from the state and donations from individuals and use volunteer labor to maintain the land. 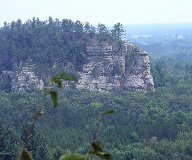 Just a year ago the Nature Conservancy purchased the “Twin Bluffs”, 161 acres of bluff land overlooking the Mississippi River village of Nelson. The land acquisition was made possible with a $300,000 grant from the Stewardship Program. Landowners sold land to the Nature Conservancy to protect the land including protection from sand mine development. The state uses bonding authority – the sale of bonds is how the state takes on debt- to finance the Stewardship Program. Increasing debt was the justification for members of the budget writing committee to vote to cut the Stewardship Program. In a partisan vote, the committee trimmed funds by a little more than 20% in the first year of the coming budget and another 9% going forward. Land conservation groups were justifiably unhappy with the cuts. But what they found more disturbing was the Finance Committee’s vote to require the state sell over 10,000 acres of Stewardship land in the next four years and require the sale of at least 250 acres more of farmland every year for the next seven years. The Finance committee action will have conservation officials draw a line around the boundaries of projects established by May 1, 2013 and sell all land not within those boundaries and acquire no new land that is not within these boundaries. In this rather cryptic description I was left to wonder what exactly the budget committee had in mind for land sales over the next few years. Using increasing debt as the justification for the seeming shutdown of future projects may be the way Republicans obtain citizen support for the changes to the Stewardship program. “I voted Republican in the last election largely because I thought it was imperative to bring our state spending under control by making tough decisions. I still support that objective and the way it was done”. That debt is climbing is indisputable. But conservation groups, like Gathering Waters Conservancy, argue the cause is not the Stewardship Fund. While state debt has increased, the program’s contribution to the debt remained relatively stable. Cynics in the Capitol suggest there is another intent among leaders that has nothing to do with reining in state debt. Some allege there is a connection between the Governor’s request in the budget to sell off state assets in possible “no bid” contracts and the sale of thousands of acres of Stewardship land. I would argue that if the sale of state assets passes as written, there may be a sale – but it doesn’t have to be the highest bidder. No conservation-minded Democrat or Republican should support a no-bid sale of state Stewardship land. MADISON - Earlier this week, the Senate and Assembly passed legislation, Assembly Bill 85, that is an outright attack on local control. This is only the most recent in a series of Republican-sponsored legislative attacks on their political enemies. This time, the victim is local government in Milwaukee. This big government move mandates the micromanagement of local government in our community, and leaves us wondering: who is next? Click here to watch the floor debate on AB 85 on WisconsinEye. The Milwaukee County Board is comprised of 18 supervisors, each representing between 50,000 and 55,000 neighbors, which is the same size as most State Assembly districts. Additionally, the County Board employs about 38 full-time staff members, including constituent service professionals, committee clerks, auditors, and budget analysts. Having a board and professional staff of that size allows supervisors to remain informed about county issues, be responsive to neighbors' concerns, and provide legislative oversight of the county executive and sheriff. Furthermore, the proposed cut raises fundamental issues about maintaining a system of checks and balances in local government, and whether the Wisconsin State Legislature should have the authority to intervene in what is clearly an issue of local control. Although groups supporting the severe restrictions argue that no other Wisconsin county has a supervisory board comparable to Milwaukee, we must also remember that no other county in our state has such an economically and ethnically diverse population of nearly 1 million people, or more than one-sixth of the state's total population. Additionally, the Milwaukee Supervisory Board oversees a $1 billion dollar budget, and is responsible for oversight of a regional airport, county zoo, and county-funded mental health complex. Critics of the current full-time board have compared the current structure of 18 supervisors and an annual salary of about $50,000 to the salary and structure of the Board in 1970. What critics have failed to mention, however, is that the Board in 1970 had 25 members, who were each paid a salary of $68,000 (when adjusted for inflation). While this bill makes enormous changes to the Milwaukee County Board, it leaves the County Executive Office completely untouched. With the long history of Milwaukee County Executives abusing their power, this proposal sets us on a dangerous course in the wrong direction. Milwaukee County has seen past executives, as recently as 2006, attempt to sell off our valued and profitable state assets, which include the Milwaukee County Airport, the Milwaukee County Zoo, and even our neighborhood parks. By preventing the board from continuing its watchdog role of the county executive, he will now have the ability to continue where others left off with regards to selling our assets. Hopefully the people of Milwaukee county will see past the smoke and mirrors and realize that this bill is less about supervisor salaries and more about hampering oversight and removing the necessary checks and balances in local government to concentrate power in the County Executive Office. In addition to circumventing Milwaukee County's local leaders, Assembly Bill 85 also ignores the wishes of the people residing in the county who are directly supporting the board. The Milwaukee County Board is an elected body and if Milwaukee County residents have a problem with their representation, it is their right to make their voice heard to promote change. Further, while this bill allows Milwaukee County residents to vote in a referendum regarding the pay of county board supervisors, that is the only provision of the passed bill that residents will be able to vote on. They will not be able to vote on increasing the power of the county executive, decreasing the budget for the board overall, or reducing term lengths by two years. Additionally, rather than putting the limited referendum to a vote during a major election, Republicans chose April 2014, an election where not all municipalities will even have major races and thus have significantly lower voter turnout. The main proponents of this legislation is an out-of-county special interest group, the county executive, and former supervisors that will not be affected by the changes. 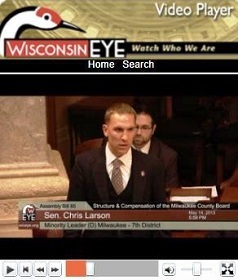 Clearly the residents of Milwaukee County were not the main consideration for furthering this bill. This bill continues what we have already seen: a calculated attack on the city and county of Milwaukee. This attack has become so brazen that a recent Milwaukee Journal Sentinel headline even asked: "Is the GOP-run state Legislature at war with Milwaukee?" Considering the proposals introduced this session, the answer appears to be yes. What Republicans seem to be forgetting is that city of Milwaukee and Milwaukee County play a pivotal role in the overall economic success of our state. In reality, as goes Milwaukee, so goes the rest of the state. Instead of continuing an unfair attack on our only world-class city, Republicans should be focusing on how to better support this economic engine.